« I have good news! Welcome to Our Dog Park Friends! Siberian Huskies Sky (left) and Tina and their friends extend a howling good welcome to everyone who has found us through the link on the PEI Humane Society website (www.peihumanesociety.com). Come join us for a walk while the Humane Society dog park is closed for annual spring maintenance. Just north of the intersection of the Trans-Canada Highway and Upton Road, you will see a paved road off Upton Road (Map). Pull in there and park. 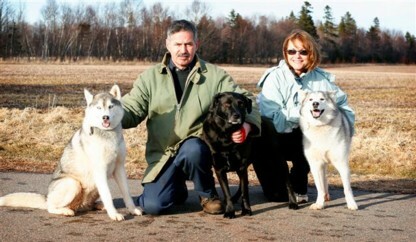 You will find people walking their dogs along the paved pathways leading into the Upton Farm. Around 9 a.m. and 5 p.m. are good times to find lots of company, depending on the days of the week. Please remind your human friends to scoop the poop so we all have a clean place to run and play! This entry was posted on April 1, 2007 at 10:06 am and is filed under Pictures. You can follow any responses to this entry through the RSS 2.0 feed. You can leave a response, or trackback from your own site.